For a woman, she has extraordinary talent. One must look for what she does, not what she fails to do. Comments on: "Johann Wolfgang von Goethe Quotes: For a woman, she has extraordinary talent. One must look for what she..."
Nature goes on her way, and all that to us seems an exception is really according to order. In the realm of ideas everything depends on enthusiasm… in the real world all rests on perseverance. To be pleased with one’s limits is a wretched state. 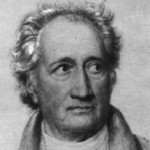 Johann Wolfgang von Goethe was born in Frankfurt am Main, Germany. He was a German poet, novelist, philosopher, playwright, and politician. He wrote several plays include: Götz von Berlichingen, Clavigo, Stella, Iphigenia in Tauris, Egmont, Torquato Tasso, The Citizen General, The Natural Daughter, and Faust. He wrote several poems include: The King in Thule, Welcome and Farewell, Erlkönig, Prometheus, Roman Elegies, Hermann and Dorothea, The Sorcerer's Apprentice, and Marienbad Elegy. He wrote several novels include: The Sorrows of Young Werther, Wilhelm Meister's Apprenticeship, Elective Affinities, and Wilhelm Meister's Journeyman Years.